Emelda by Django & Juliette is a modern t-strap enclosed toe heel. 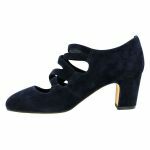 You would wear Emelda to work or to any formal occasion as the diagonal across foot straps bring an elegance to the overall look of the heel. 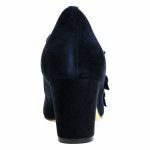 Emelda has a soft and supple suede outer so be sure to brush frequently to maintain the life of the heel. 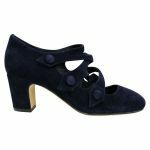 Emelda has a padded footbed for instant and lasting comfort as well as straps secured with velcro for ease of wear. 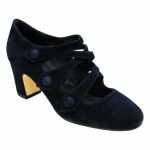 Emelda has a rounded toe leaving a little extra room if you are wider across the toes.